Reduces volume, protects, restores damaged hair, and re-aligns the hair fiber, all in one process! Its formula contains Amazon Gloss, Soft Amid, Kerahair, Hydrating Agents, Miracle Oil Blends and High Liss: nourishing, sealing technology derived from the association of bio compatible amino acids and protein acids which allow the progressive alteration of the hair structure. Provides and promotes nourishment, hydration, detangling, shine and natural movement. Diminishes and controls volume, reducing frizz. DERMATOLOGICALLY TESTED. AMAZON GLOSS: Originating from Amazon Palm Tree fruits, amazon gloss promotes detangling, reduces frizz and reduces fly-away effect. Restores natural hydro lipid layer providing shine, hydration and protection. SOFT AMID: Conditioning agent. Detangles and reduces frizz. KERAHAIR: Protects the hair fiber from oxidation damage, restoring resistance, flexibility and strength. Regenerates lipid layer and protects keratin in the hair. Minimizes color fading, restores vitality and shine. HYDRATING AGENTS: Provide malleability, shine, hydration and softness. MIRACLE OIL BLEND: Restores damaged hair. Restores protein amino acids and lipids which increase elasticity and resistance. Provides softness and reduces frizz. 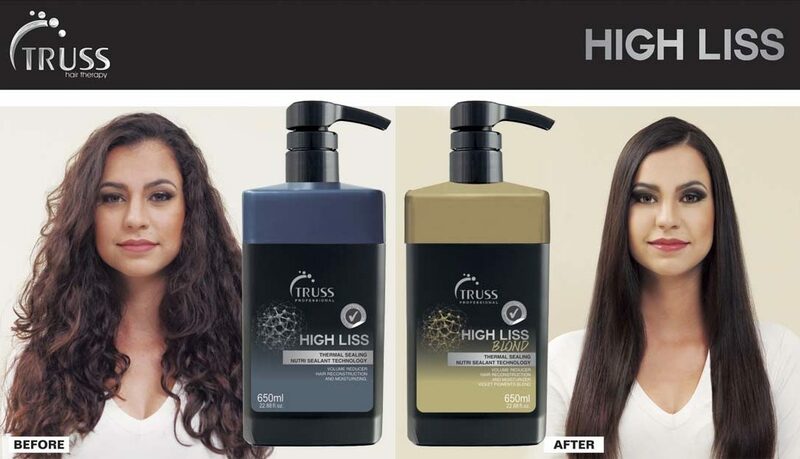 HIGH LISS: nourishing, sealing technology derived from the association of bio compatible amino acids and protein acids which allow the progressive alteration of the hair structure. Provides and promotes nourishment, hydration, detangling, shine and natural movement. Diminishes and controls volume, reducing frizz. Was specially developed for blond, bleached or virgin hair. It contains an anti-yellowing technology such as Blend of Violet Pigments, which neutralizes undesired orange/copper tones. High Liss promotes volume reduction, re-alignment of the hair fiber and restores damages caused by other chemical processes, all in one process. Its formula contains Amazon Gloss, Soft Amid, Kerahair, Hydrating Agents, Miracle Oil Blends and High Liss: nourishing, sealing technology derived from the association of bio compatible amino acids and protein acids which allow the progressive alteration of the hair structure. Provides and promotes nourishment, hydration, detangling, shine and natural movement. Diminishes and controls volume, reducing frizz. **All items above plus Blend of Violet Pigments.